In an otherwise comparatively stable Somaliland, the district of Ceel Afweyn has been prone to some conflict over the past two years. Ceel Afweyn is a district plagued by disagreements over scarce grazing land, lack of water resources and arguments over political power. As sometimes the conflict escalates into violence, the worst effects are borne by children, women, youth and families. The declaration of peace resulted from Somaliland-led mediation between the feuding communities. According to Interpeace, the organisation directing the process, the peace process was locally owned from the very start and serves as a good example of a community-led initiatives. Before formalising the agreement, there is set to be another round of validation with the local communities. 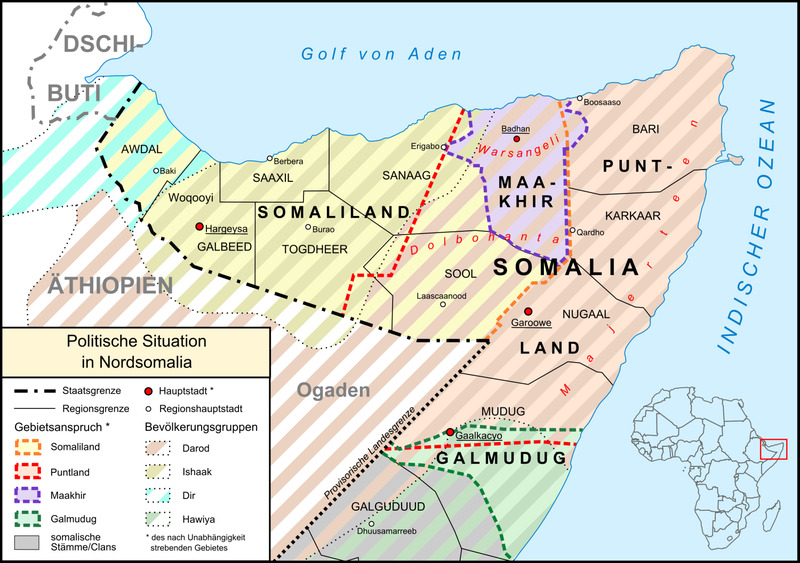 Ceel Afweyn is a district in Somaliland that has recently been prone to conflict, mostly driven by disagreements over grazing land, scarce water resources, and disputes over political power and influence. Over the past two years, the district has experienced conflict between two local communities, leading to a rise in armed violence amid a humanitarian crisis caused by a severe drought. It has been the case that whenever conflict escalates into violence, the worst afflictions are borne by children, women, youth, and families. In this recent case for instance, militia violence and limited government and police presence caused the closure of many schools and in other ways disrupted community life. The situation in Ceel Afweyn is anomalous in an otherwise stable Somaliland. After considering the loss of lives and the overall toll of the conflict, members of the two feuding communities decided to sue for peace. The Academy for Peace and Development (APD), supported by Interpeace, agreed to support a one-month mediation process initiated under the auspices of the Somaliland Government in mid-July 2018. A 66-member delegation, drawn from all the six regions of Somaliland, was formed to help convene the communities. The delegation devoted immense time and energy to the process, encouraging the two communities to disarm their respective militias and securing their commitment to dialogue. To complement the efforts of the delegation, 25 women from the two feuding communities organized themselves into an informal peace structure. The women began visiting homes in the villages surrounding the town of Ceel Afweyn, where they spread messages of peace, raised awareness of the ongoing mediation process, and updated villagers about the progress of the dialogue. On its part, APD facilitated focus group discussions to help map the needs and priorities of the communities beyond the immediate-term goal of halting the prolonged conflict. APD also held a workshop for over 50 youth from Ceel Afweyn and Hargeisa, to enhance the capacity of young people to actively participate in the conflict resolution and reconciliation process. In the end, the two communities agreed to reconcile and announced a ‘Declaration of Peace’. Expectant residents, politicians and civil society representatives crowded the town, eagerly waiting to receive the final version of the peace agreement. The communities further formed a Coordination and Monitoring Committee to help settle their past grievances by bringing justice and overseeing the implementation of the peace agreement. Following the ‘Declaration of Peace’, APD took the opportunity to consult different groups within the society in Ceel Afweyn, including women’s groups, youth and elders. The consultations sought to establish the needs and priorities of the local communities as a first step in the incremental process towards long term peace and reconciliation. During the consultations, residents requested APD and Interpeace to provide support for the establishment of a youth committee and a women’s committee with representation from both communities, to support further awareness-raising activities about the peace agreement, and to facilitate connections with the business community as an important player in the peacebuilding process. These inputs and requests will be validated with the wider community before being formulated into concrete engagements by APD and Interpeace in support of the communities’ desire for lasting peace. It was apparent from the reaction of the residents of Ceel Afweyn that the reconciliation between the two communities was long overdue. The ‘Declaration of Peace’ has gained strong traction in the district, and the success of the Ceel Afweyn mediation process has attracted the attention of the Somaliland Government. The Minister of Interior, Mohamed Kahin, lauded APD for “their immense efforts during the reconciliatory talks” and for mobilizing the required support to make peace a reality for the estimated 100,000 residents of Ceel Afweyn. The success of this initial phase of the peacebuilding process in Ceel Afweyn inspires the hope of sustainable peace in the future. The pledge by the two rival communities to leave their past grievances behind and to instead look forward is an encouraging sign for APD and Interpeace to continue supporting the implementation of the peace agreement and other subsequent initiatives towards building trust and social reconciliation. The prospect of long-term peace is further bolstered by the fact that the reconciliation effort was initiated by the communities themselves, anchored in traditional Somali conflict resolution mechanisms, and with the full support of the government. “The mediation in Ceel Afweyn was Somaliland-led, locally owned and a culturally-rooted process, which enabled local actors to solve their problems,” said Mohammed Farah, Director of APD.